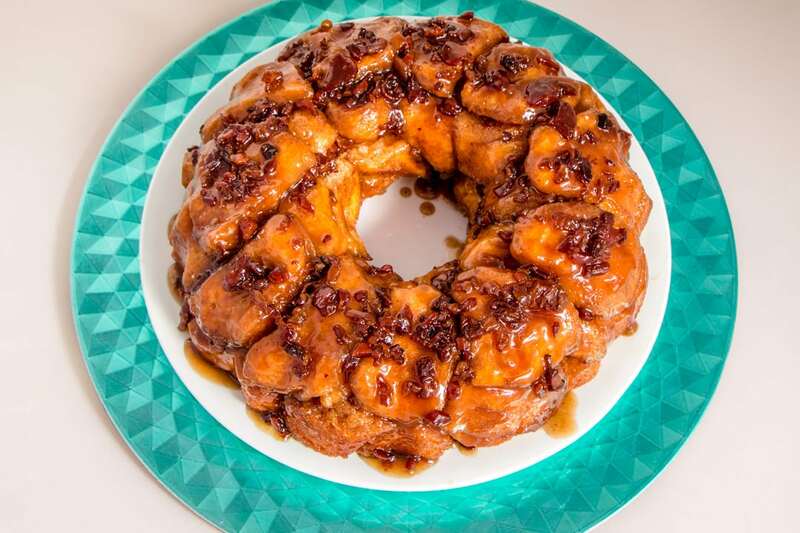 The Maple Bacon Monkey Bread are a spin on the more traditional Monkey Bread posted here. 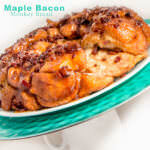 But the added flavors of the Maple and Bacon throw your tastebuds into a salty sweet ride of goodness. With boys living in my home, you can imagine how much they love bacon, so why not mix it with maple? 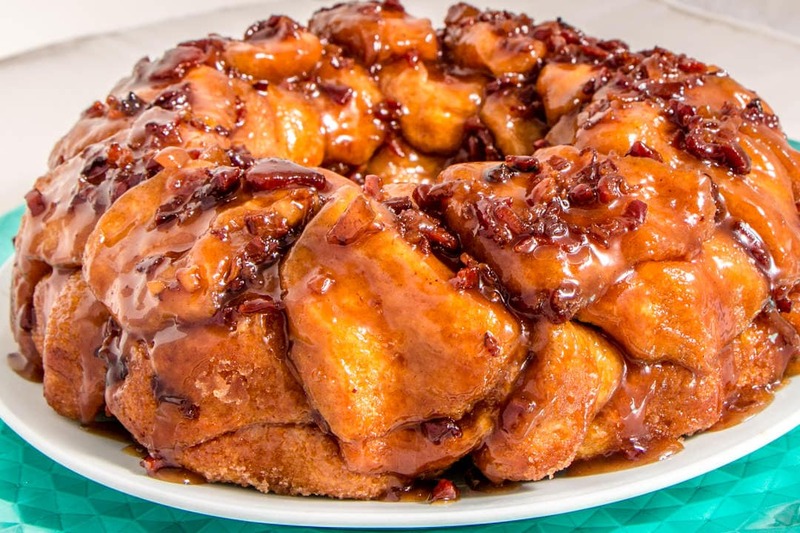 Be forewarned, this Maple Bacon Monkey Bread is sweet, the added brown sugar with maple that becomes oey gooey in a rich goodness. You will want to chase it down with a big glass of milk for sure! I love the help in the kitchen and this has been a recipe I have taught my boys from a young age to help make. It’s just something they really can’t mess up, yet they feel the success of making something that everyone devours. It’s important to me to help them feel comfortable in the kitchen, so I start them young in helping make simple recipes. Now as they are grown this theory has worked well, as they each cook once a week from their favorite recipes. #Win for Mom! 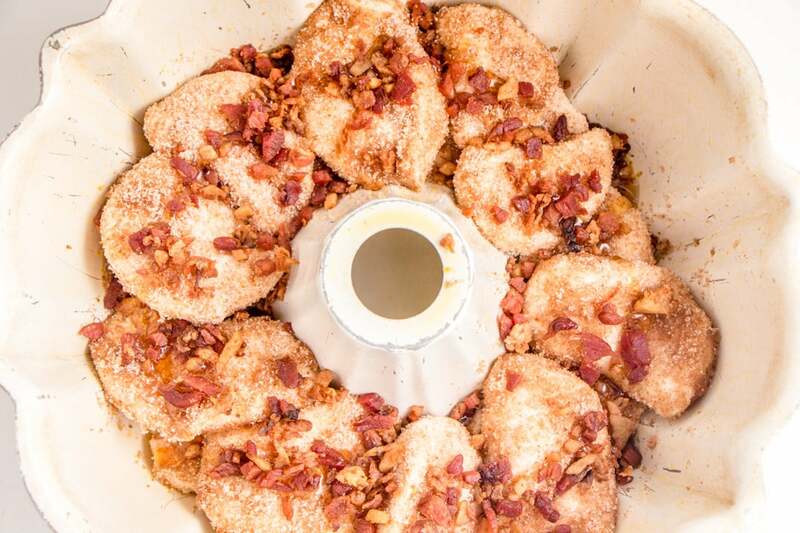 Mix up your white sugar with cinnamon in a separate bowl, melt butter in a separate bowl, and mix maple syrup, brown sugar and Bacon in it’s own bowls. Did you catch that? Three separate bowls! Grease your bunt pan, and pout the maple syrup mixture into the bottom. It will settle into the deepest ruts of the pans and that is perfect. 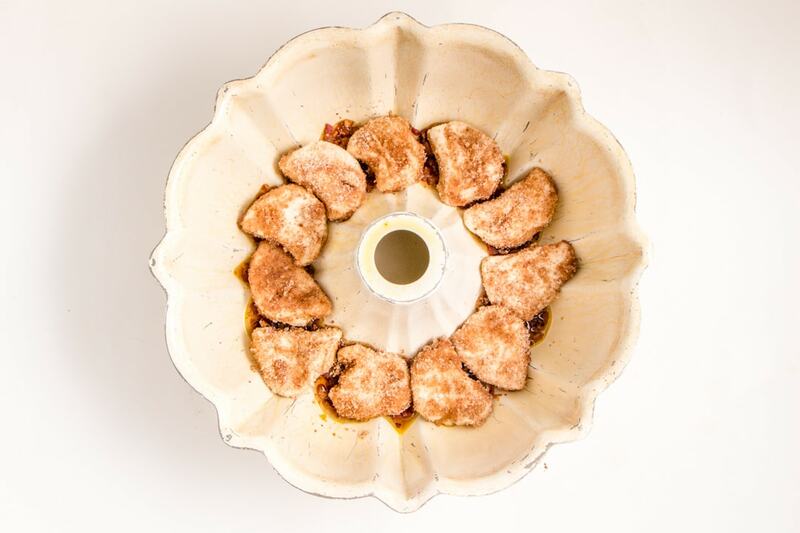 Next dip your biscuits into the melted butter and then into the cinnamon sugar mixture. This is a bit messy. I use two fingers to pinch the edge of the biscuit to dip into butter and then dip into the sugar. For me it works great. On the other hand, my sons use their full hands…haha..over time they have improved their technique. It’s really just what works for you. Half way through sprinkle some more Bacon goodness before finishing the rest of the biscuits. 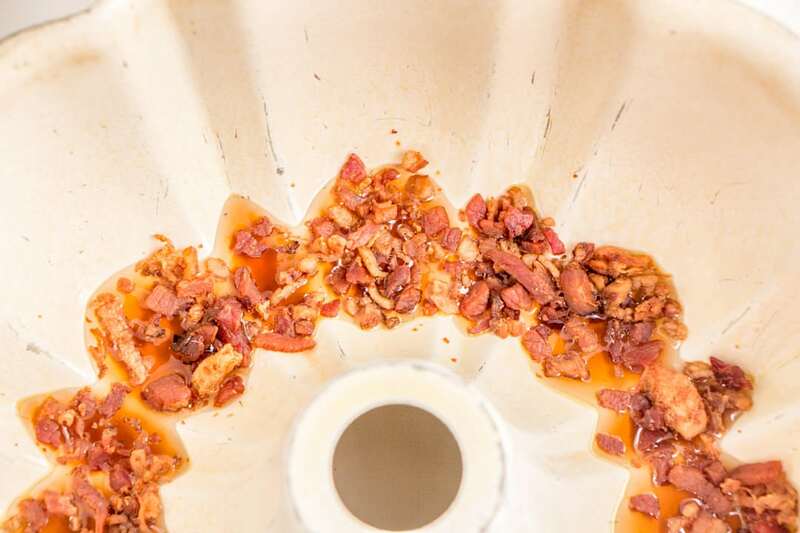 You will love the added bonus of bacon bits in the middle. Yummy! Of course, don’t forget to sprinkle bacon on top. Having more bacon is never a bad thing. 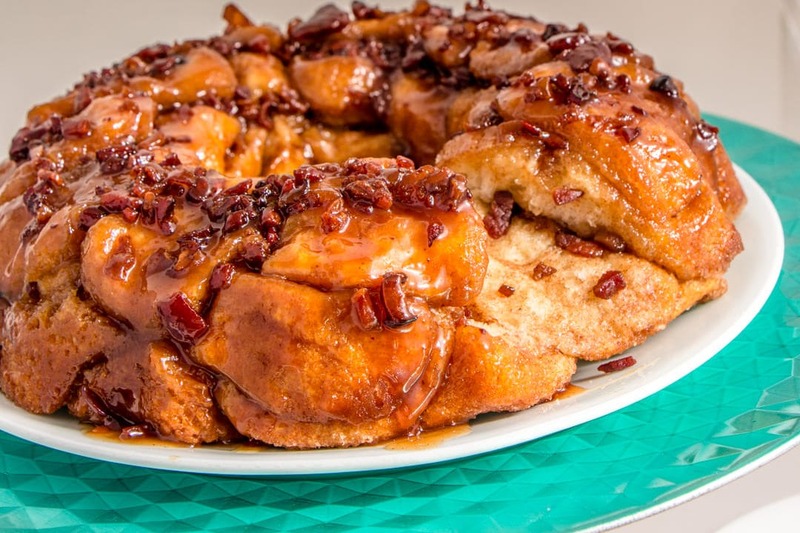 The Bacon and Maple combination in this Monkey Bread will curb any salty sweet craving you have. It's easy to make and wonderfully delicious. 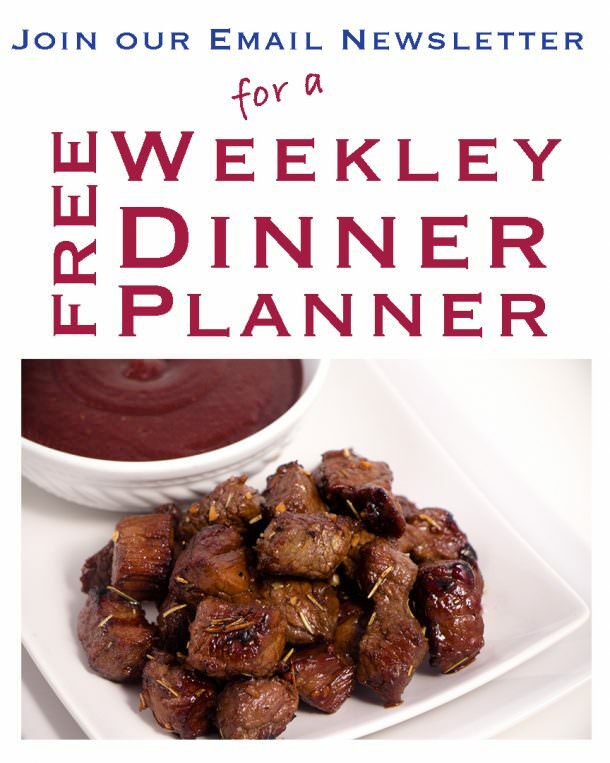 Perfect for any day of the week. In a bowl mix Maple Sugar, Brown Sugar and Vanilla and 1 cup bacon. Pour into greased bunt pan to cover the bottom. 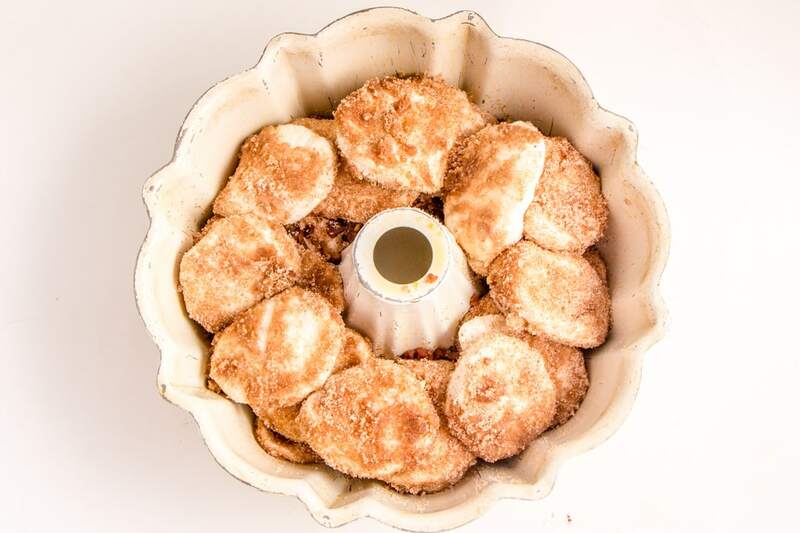 In a separate bowl, mix white sugar and cinnamon. This will be used to dip your biscuits into. A larger cereal bowl works best. Dip biscuits one a time into butter and then dip into sugar and cinnamon mixture. Then place into the bunt pant side by side creating a circle around the pan. Do this for 2 tubes of biscuits. After 2 tubes of biscuits, sprinkle 1/2 cup bacon evenly over biscuits. Repeat with additional tubes. First dipping in butter and then cinnamon and sugar mixture. Finish with sprinkling remaining bacon crumbles. Bake at 350 degrees for 25-35 minutes. To check if done, poke a knife into the center and check for doneness. Middle biscuits tend to be doughy if pulled out too soon so check to make sure middle biscuits are baked. Remove from over and place a large plate over the top of pan and invert pan to flip out bread. Enjoy! The grandchildren devoured these. It was fun to have something different as a surprise for them.